VISHAY Intertechnology, represented by Braemac , has released two new devices in the 592D family of solid tantalum chip capacitors, which provides the highest available capacitance values for low-profile tantalum capacitors. 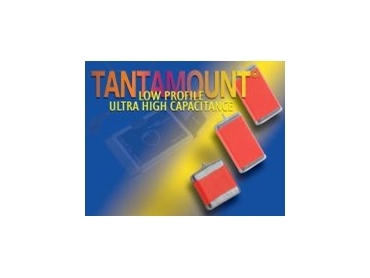 Part of the Vishay Sprague Tantamount product line, these new capacitors are designed for low-profile applications, such as wireless GPRS PCMCIA modem cards and cell phones, requiring very high capacitance. The devices' low ESR values help to reduce power consumption, while their compact case size enables the design of lighter, smaller, more portable end products. In some applications, these high-capacitance devices may be used to replace several capacitors with lower ratings, saving board space and decreasing component count. The 592D capacitors are available in "X" and "Y" cases with dimensions of 0.570” by 0.290” (14.5mm by 7.37mm) and height profiles of 0.079” (2.0mm) and 0.098” (2.5mm), respectively. The 592D228X_6R3X2_ in the X case features capacitance of 2200µF and a maximum current leakage of 139µA. In the Y case size, the 592D338X_6R3Y2_ offers a capacitance value of 3300µF and maximum current leakage of 208µA. At 6.3WV dc both devices offer a maximum dissipation factor of 35%, very low ESR of 0.055Ω, and ripple of 1.80A during operation at +25°C and 100kHz. Capacitance tolerances of ±10% and ±20% are standard. Tantalum capacitors in the 592D family are conformal coated, feature two 100% tin terminations, and are case-code compatible with EIA 535BAAC and CECC 30801 moulded chips. The devices are specified for an operating temperature range of -55°C to +85°C.